Gray Line Halong offers a different and unique cruising experience controlled by the quality management of Gray Line International. Relaxing on our large sundeck will be an ideal alternative to your holiday beside our exotic kayaking and boat trip. You can enjoy sunbathing, cocktail drinking, wine taste, and especially trying foot massage. There’s nothing perfect than drinking a bounty glass of wine while our professional and helpful massagers taking care of your feet. Vietnam Typical Tours team arrange your trip to Halong bay with Gray Line cruise with best price. 08:00: Expect to depart in a fine day from Hanoi, with our convenient coach, tourists will be tremble with excitement while enjoying sigtseeings through the coach’s window on the way to the picturesque Halong Bay. tourist will have a half-way stop for relaxing. 12:15: Arrive at Tuan Chau Marina pier, Tuan Chau island, Halong city, Tourists will be surprised at the charming beauty of Ha Long Bay- the complex of ecodiversity with shinning blue water and ready to discover the marvelous journey perfectly when put the fisrt step on our luxury Gray Line Halong cruise junk. 12:30: Transfer by tender to the Gray Line Halong cruise boat – welcome drink. In order to make sure tourists will have a completely sucessfull Cruise, cruise will have a briefing and check in cabins for tourists. 13:00: Tourist will have lunch on cruise that is set perfectly. Besides, Cruise’s staffs will give you the professional service ever. Cruising heading to Vung Vieng Floating Fishing village. 14:30: Finally tourists arrive to the Vung Vieng fishing village and visiting this village by local rowing boats. After arriving Vung Vieng fishing village, you will have 02 options to choose the way to go visiting the village: by joining rowing bamboo boats or kayaking by yourself. During the trip, tourists will catch up the precious experiences. Tourists will pass through floating houses of 65 families, a floating school & floating information centre. 18:30: Cooking demonstration will be on the sundeck. Let’s see how to make the fresh fried spring rolls and mix fish-sauce. Or how to make flower from carrot by our skillfull carving chefs. Tourists will not forget these delicous dishes that is unique in Ha Long. 19:30: Under the magnificent night sky, in magic atmosphere in Ha long Bay, tourists will ẹnjoy luxury buffet dinner served with a variety of BBQ seafoods at nice stars terrace. Above 15 pax: BBQ seafood dinner on sundeck. Less than 15 pax: set menu dinner on sundeck. Dinner are served by sundeck bar- Stars bar. 21:00. Board and card games are available or join the squid fishing on boat with our crew. Moreover, tourists can enjoy the squid with our cook chef after fishing them. Karaoke singing on Star bar – sundeck, with variety languages: English, Spanish, Russian, French…. Or simply, tourists can enjoy Ha Long at night. it is now like a floating city, with twinkle of light from hundred Cruises, so great. 22:00: Overnight anchorage near Drum cave area. Now it’s time for tourists to relax comfortably and have a deeply sleep on our king beds with beautiful dreams as in a fair-tale story. End the first day cruise. 06:30: Wake up in early morning, tourists can not miss to welcome the dawn on the sun deck to refesh and get start for a new day. Tourist will take part in Tai Chi class on the sundeck to get full of energy. 08:30: If tourists have seen ever some movie about paradise, Amazing cave will help tourist to see in naked eyes. This cave with colorful lights is attract millions of tourists every year. 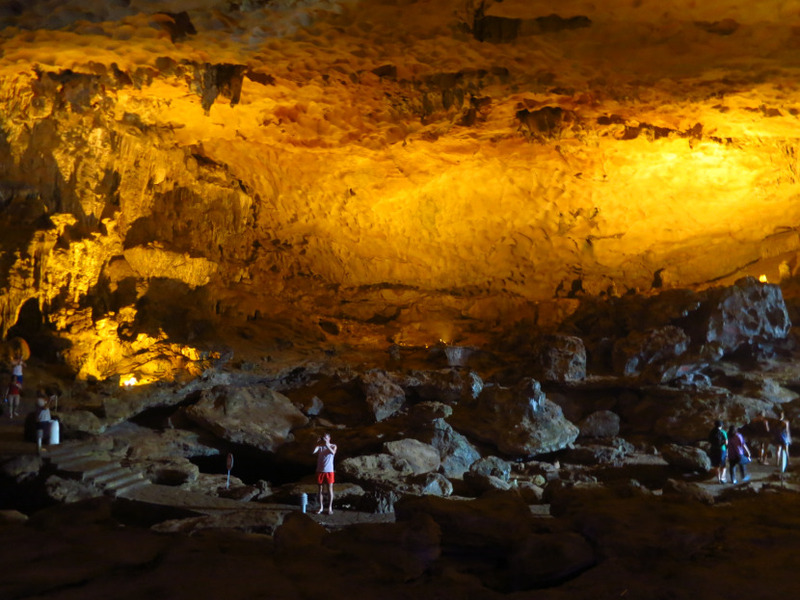 Tender will send tourists to go to visit Amazing (Sung sot) cave that was discovered by the French in 1901 and opened to tourists since 1936 and symbol for geology value of Halong. 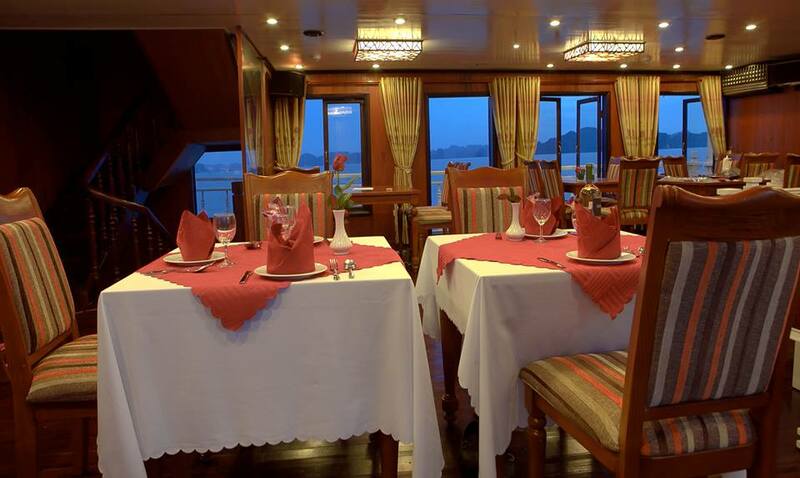 09:30: Keep all the precious moments in mind,Tourist will check out of cabin and relax on the sundeck or in the dining room enjoying the bay scenery as we approach the pier. 10:00: Farewell Buffet brunch and hope to serve tourist soon again.